Fangbone! is the story of a young barbarian warrior from Skullbania who travels through a magical portal into the suburbs of our world with a most dangerous burden. His mission is to protect the blackened and slightly jam-smelling big toe of Venomous Drool from being reunited with its master – the evilest sorcerer in all the planes of existence! 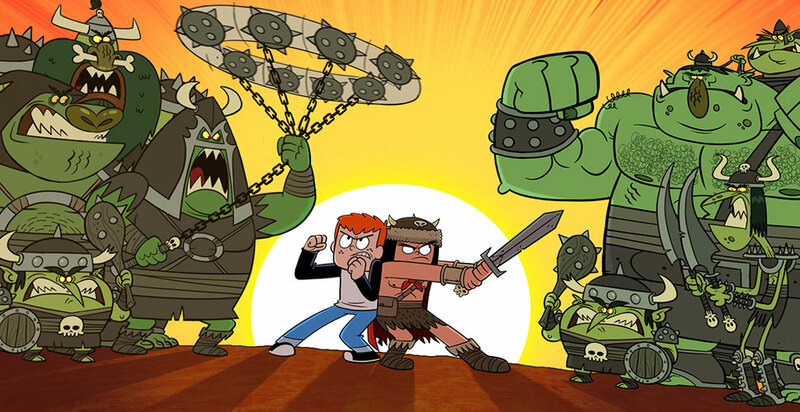 Fangbone becomes the best friend of Bill – a kid whose weirdness is his ultimate weapon – and who helps Fangbone survive in a world of spelling tests and waffles. Together, Fangbone and Bill battle Drool’s monsterish creations, along with fat-fingered foot finders, independent magical contractors, and even the thieving Shadowsteppers – keeping the toe safe from any who would use its evil powers. Fangbone! is a tale of epic comedy, epic action and epic epicness! The series is based on the books by New York Times bestselling author Michael Rex. Fangbone! is a Radical Sheep Production.